In the summer of 1961 while working as a guard at the American Museum of Natural History in New York, Dan Flavin started to make sketches for sculptures in which electric lights were incorporated. Late in that year, he made his first light sculptures which he called ‘icons’. For years I thought that Flavin was attempting to re-create the colour field painting and abstract expressionism of Mark Rothko and Robert Motherwell in florescent lighting. I now believe I was wrong about this. Flavin hated when viewers called his lighting “neon” rather than florescent, as neon was custom-made and florescent was not. His sculptures for him were simply “ready-mades”–the term for Marcel Duchamps penchant for taking “found” objects and putting them on display as art, such as his Fountain (a men’sroom urinal 1917) and his bicycle wheel. 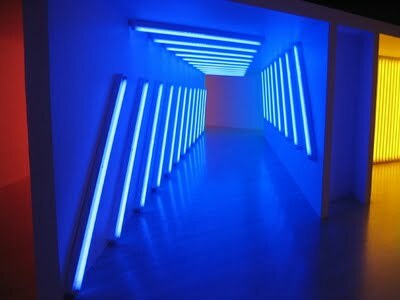 Flavin also had a habit of not titling his sculpture, which is another indication he wished them to be considered as found art rather than anything too deliberate. When a gallery patron once described Flavin’s art like “coming into a church” he said “more like a subway.” This one is called 1981 Untitled.